The Mayo Clinic describes weight control as a balancing act. An imbalance between calories you consume and calories you burn is necessary for weight loss, but once you achieve your desired weight, the requirements change to an overall equal balance between calories in and energy out. 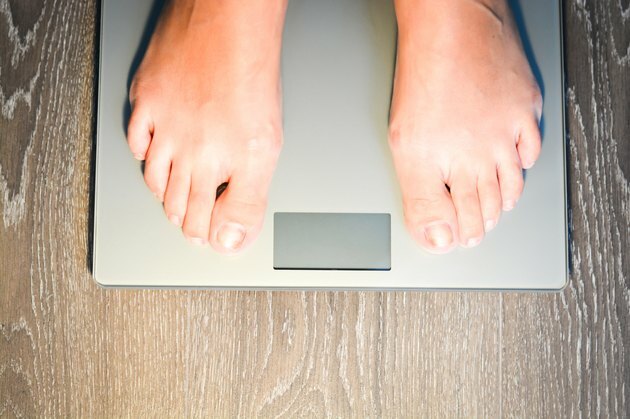 In a seven-week period, the amount of weight you can lose depends on the degree of the imbalance, created mainly by the type of diet plan you follow. You have three options for choosing ways to lose weight. Since every pound of weight you intend to lose requires eliminating 3,500 calories from your current calorie intake, you can reduce calorie intake, follow or intensify an exercise program or use a combination of both methods. Consult your doctor before beginning any new diet or exercise regimen. A major factor in determining how much weight you can lose in seven weeks is the diet plan you follow. You can choose a diet plan recommended by organizations such as the American Heart Association that follows principals of good nutrition and steady, sustained weight loss. Alternatively, you can choose to follow a quick-weight-loss, or fad, diet that may result in greater weight loss over a seven-week period, but does not typically promote proper nutrition or sustained weight loss. If you choose a healthy diet plan, the National Heart, Lung and Blood Institute and National Institutes of Health estimate you can expect to lose 1 to 2 pounds each week, or 7 to 14 pounds over a seven-week period. To achieve this, the agencies explain that you must reduce your weekly calorie intake by 500 to 1,000 calories. This should translate to between 1,000 and 1,200 calories each day for women and 1,200 to 1,600 calories daily for men. Your healthy diet plan should be low in saturated and trans fats, cholesterol, salt and foods with added sugars. Trade foods fitting these description for more fruits, vegetables, whole grains, low- or non-fat dairy products and lean protein. If you choose a fad diet, total weight loss will depend in the type of diet you follow. For example, the American Heart Association reports that the food-specific, quick-weight-loss cabbage soup diet claims you can lose 10 to 17 pounds within the first week. Even if the rate of weight loss slowed over the remaining time, you would achieve a substantial weight loss over seven weeks. A third option, outlined by the Mayo Clinic, could result in a total weight loss of about 12 to 22 pounds over seven weeks. If you are severely overweight, and under a doctor’s care, you could start with a very-low-calorie diet for the first week, followed by a normal, healthy diet for the remaining six weeks. The longer you remain on a fad diet, the greater your chance of developing nutritional deficiencies, the AHA warns. Because weight-loss plans that promise quick results are often food-specific or liquid diets, you lose the health benefits you get from eating foods from each food group. Some diets are so nutrient-deficient, the AHA cautions, that it may only take a few weeks for deficiency symptoms to develop. In contrast, a healthy weight-loss plan is one you can remain on for an extended time, roll over into a weight-maintenance plan by adjusting calorie requirements — and at the same time eat foods you enjoy and that protect your health. Talk to your doctor before getting started with your diet. If you choose a very-low-calorie diet, your doctor should monitor your progress to ensure your health and safety. Mayo Clinic: Fast Weight Loss – What’s Wrong With It?